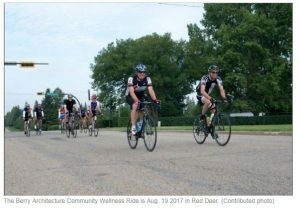 Two world-renowned cyclists will participate in this year’s Berry Architecture Community Wellness Ride. Tyler Hamilton and Alex Stieda will be in Red Deer Aug. 19 for the ninth annual event, which raises money for the Canadian Mental Health Association, Central Alberta Region and the Central Alberta Brain Society. It’s been a few years since the event has had celebrity guest riders, so being able to have the two retired professional athletes participate is quite the catch, said Berry Architecture CEO George Berry. Stieda, the first North American to win the Tour de France yellow leader’s jersey in 1986, is a long-term supporter of the Wellness Ride, said Berry. “We’re excited to have Alex back again. A lot of people like riding with him, he’s just a super guy,” he said. Stieda, who lives in Edmonton, also competed in the 1984 summer Olympics and won a bronze medal for individual pursuit at the 1982 Commonwealth Games. This will be Hamilton’s first time participating in the Wellness Ride, but he was a part of a Canadian Mental Health Association fundraiser in Red Deer four or five years ago, Berry said. “We’re really looking forward to having Tyler back. He made some adjustments to his schedule so he could make it here. “People that are cyclists or have mental health issues have Tyler close to their heart. He understands the challenges and struggles,” Berry said. Hamilton raced for 14 years, completing 11 grand tours including the Tour de France eight times. He released his memoir “The Secret Ride” in 2012, which went on to become a New York Times Bestseller. In its nine years, the ride has raised at least $175,000, with the goal of raising $40,000 this year. “All the money stays local and 100 per cent of the money raised goes in – there will be zero administration costs,” he said. It’s $100 to participate in the 10K and 25K rides, and $200 for the 50K and 100K rides. “We’re really looking forward to it. We’re hoping to get a wide variety of riders out this year,” he said. To register for the ride or for more information, head over to www.wellnessride.ca.